The national rugby union teams of France and New Zealand (the All Blacks) have been playing each other for over a century; as of 19 October 2015, they have played 56 Test matches against each other. The first encounter, which was also France's first Test, took place in Paris in January 1906 and was won by New Zealand 38–8. It was not until 1954 that France secured their first win over New Zealand (3–0). France first toured New Zealand in 1961 – before any of the Home Nations – and the All Blacks won all three Tests. The All Blacks' first full tour of France was in 1977,[i] when they won one of the two Tests. France first defeated the All Blacks in New Zealand on Bastille Day 1979. France achieved a first series win in New Zealand in 1994, when they won both Tests. Since 2000, the two teams have contested the Dave Gallaher Trophy. The teams' World Cup history includes seven matches - the most for any pair of teams. They have played two tournament finals, in 1987 and 2011 (both at Eden Park and both won by New Zealand). Overall, the All Blacks have won 42 Tests against France's 12, with one match drawn. The largest winning margin in a Test between the countries was a 61–10 victory to the All Blacks at Westpac Stadium in Wellington in 2007. The most career points scored by members of either team is 92 by Andrew Mehrtens; he also holds the record for points in one match with 29. Despite the vastly superior win record of New Zealand in this encounter, France has the greatest number of wins against the All Blacks of any Northern Hemisphere opponent to date. France are sometimes called the "bogey" team of New Zealand, known for having inconsistent results in regular test matches, but have proven to be fierce opponents in the knockout stage of the Rugby World Cup. All Black campaigns in The Rugby World Cup were halted by defeats to France in 1999 and 2007, and were nearly upset again in 2011 with a very narrow 8-7 victory in the final. The first-ever New Zealand tour to the Northern Hemisphere was in 1905–06. It was also the first time they wore a black strip and the first time they performed the haka. 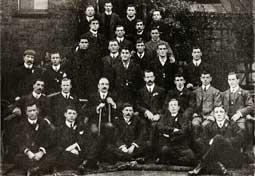 The team – known today as "The Original All Blacks" – played various club and national sides throughout the British Isles before taking on France on 1 January 1906. This was France's first Test and was held at Parc des Princes, Paris. The All Blacks scored ten tries, including six in the second half, to France's two, and won 38–8. Despite the scoreline, France's two tries were more than any previous team had scored against the All Blacks on tour. Commenting on the state of French rugby in their book The Complete Rugby Footballer, Original All Blacks Dave Gallaher and Billy Stead wrote: "We are strongly of the opinion that the game will spread in their country and that in the course of time they will put a team in the field which will command the utmost respect of any other." The 1924–25 All Blacks' Invincibles tour included a Test against France. [ii] The teams met at the Stade des Ponts Jumeaux in Toulouse on 18 January 1925. Although French rugby had improved since 1906,[iii] the All Blacks still won 30–6, with France scoring two tries. All Blacks' captain Cliff Porter said of France "Your forwards gave us a lot of bother. Your three-quarters were not so good." In 1926, France lost to the New Zealand Maori. Perhaps the "most celebrated Maori side in history", they undertook a seven-month 1926–27 tour of Australia, Ceylon, France, Wales and Canada, playing 38 matches, winning 29 and losing seven, with two draws. In total, the Maori scored 712 points while conceding 215. This was the last match between a New Zealand representative team and France for nearly three decades. In 1932 the International Rugby Football Board (IRB) expelled France from the Five Nations Championship for breaching the professionalism rules in its domestic club competition. Consequently, the All Blacks did not face France during their 1935 British Isles' tour. Although France was readmitted in 1939, the Second World War intervened, suspending international competition. In 1946, France played two matches against a team selected from the New Zealand Expeditionary Force, nicknamed the "Khaki All Blacks". Despite the team not being a representative New Zealand side, they included many future All Blacks. 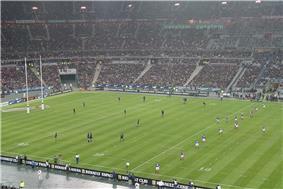 The games took place on 10 March at Stade Colombes, Paris, and on 24 March at Wallon Stadium, Toulouse. The Khaki All Blacks won both (14–9 and 13–10). The 1954 match at Stade Colombes, Paris, was dominated by the All Blacks who had the majority of possession and territory. Despite this, France scored in the 35th minute after the ball was lost by All Blacks' half-back Keith Davis 40 metres (130 ft) from France's line. The ball was picked up by French number eight Robert Baulon who passed to Paul Labadie. Labadie then passed to French captain Jean Prat who scored a try, giving France a 3–0 lead that the All Blacks failed to close. Although New Zealand relentlessly attacked the French line – and made several drop goal and penalty attempts – the French defence held, earning France their first win (3–0) over the All Blacks. France first toured New Zealand in 1961 – before any of the Home Nations. The first Test at Eden Park was won 13–6 by the All Blacks after they scored two converted tries and a penalty. France's first five-eighth Pierre Albaladejo kicked all of France's points with two drop goals, prompting the New Zealanders to nickname him "Monsieur Drop". The second Test of the tour was played at Athletic Park in Wellington. The wind was very strong and neither team scored during the first half. In the second, playing into the wind, France scored a try to lead 3–0. The All Blacks' Kel Tremain responded with a try. In one of the best conversions of his career, Don Clarke kicked almost parallel to the goal-line, relying on the strong wind to gust the ball over the posts. The Blacks won 5–3. Although the All Blacks won the final Test in Christchurch 32–3 to take the series, the tour had a positive influence in France where it was broadcast on national television via satellite, popularising the sport beyond its traditional heartland of the southwest. The next two matches between the teams were both in Paris. The All Blacks won the first 12–3 in 1964 after tries from Ralph Caulton and Ken Gray. In the next match, in 1967, the All Blacks were coached by Fred Allen and captained by Brian Lochore; they won 21–15. In 1968, following their first Five Nations Grand Slam, France toured Australia and New Zealand. They were defeated in their Test against Australia and in all three against the All Blacks. The All Blacks' side was particularly strong and won all its Tests between 1965 and 1970. France's touring losses presaged a string of defeats that did not end until they drew against Wales in the 1969 Five Nations (in which France finished last). France achieved only their second Test victory over the All Blacks in 1973 at Parc des Princes, Paris. The All Blacks had defeated England, Scotland and Wales, and drawn with Ireland on their 1973 tour and France was their last Test. France won 13–6, and scored two tries to nil, with two penalties the only points from the All Blacks. In 1977 the All Blacks made their first-ever full tour of France. France won the first Test in Toulouse and the All Blacks the second in Paris. France then reciprocated and toured New Zealand in 1979. This time, neutral referees were appointed for the first time. The All Blacks won the first Test 23–9 at Lancaster Park. However, in the second Test, France upset the All Blacks by winning 24–19 on Bastille Day at Eden Park. The victory was France's first win in New Zealand over the All Blacks. The 1980s saw many France – New Zealand Tests. The first two were in 1981 when the All Blacks toured France, visiting in Toulouse and Paris; the All Blacks won both Tests, 13–9 and 18–6 respectively. In 1984, France visited New Zealand for two Tests. They lost the first, at Lancaster Park, 10–9 (despite repeated French drop goal attempts) and the second, at Eden Park, 31–18. In 1986, France played a one-off Test in New Zealand, at Lancaster Park. Many top All Blacks were serving a two-month suspension for participating in the rebel Cavaliers tour to South Africa. The team that faced France became known as the "Baby Blacks" as all bar two of them were either making their Test début or were very inexperienced. The Baby Blacks upset France 18–9 in front of 24,000 spectators; the only try coming from number eight Mike Brewer. Later in 1986, the bans served, the full All Blacks toured France. They won the first Test, in Toulouse, 19–7. Their next match, at Nantes, became known as "the battle of Nantes". France played aggressively and tried to intimidate the All Blacks. All Black Buck Shelford had his scrotum rucked in the twentieth minute that required stitches while he was still on the field. He was later knocked out, losing several teeth in the process, and did not finish the match. The aggressive display by France paid off and they won 16–3. The following year France and the All Blacks met in the final of the inaugural Rugby World Cup. The tournament was co-hosted by New Zealand and Australia and the final was held at Eden Park. The All Blacks were captained by David Kirk and went on to win their first World Cup 29–9. According to the All Blacks' coach at the time, Brian Lochore, the previous year's loss in Nantes was the catalyst for their World Cup victory. Shelford said of the match "We wanted to play them in the final because we wanted revenge". The match also helped improve the diplomatic and political rift between France and New Zealand caused by the 1985 bombing of the Rainbow Warrior by French Secret Service agents. France toured New Zealand in 1989 and played a two Test series. They lost both Tests; the first 25–17 at Lancaster Park, and the second 34–20 at Eden Park. In both Tests the All Blacks led at the half time break, with France responding by scoring most of their points during the first 15 minutes of the second half before the All Blacks counter-attacked to win in the last quarter. The All Blacks' reciprocal tour of France came in 1990. Again two Tests were played and again they were won by the All Blacks; 24–3 at Nantes, and 30–12 at the Parc de Princes. The All Blacks first-five eighth Grant Fox, dominated both matches, scoring 16 points in the first Test, and 22 points in the second. The next tour was of New Zealand by France in 1994. In a major upset for New Zealand rugby, France took the first Test 22–8 at Lancaster Park, coinciding with Frenchman Philippe Sella's hundredth match for his country. Sella said of the game "But this historic victory for my 100th cap, with a score I never imagined—that's one of my really great, great memories". The second and final Test on tour was at Eden Park on 3 July 1994. The All Blacks were winning 20–16 with three minutes remaining after Matthew Cooper had kicked a penalty. The French counter-attacked and ran the ball the length of the field from their own in-goal area to win. The ball was handled by nine French players before the try was scored by Jean-Luc Sadourny. French captain Philippe Saint-Andre called it "a counter-attack from the end of the world", and it was then labelled the try from the end of the world. The try gave France a 23–20 win and a 2–0 series win over the All Blacks. In 2003, Daily Telegraph readers voted the try the fourth best of all time in either rugby union or rugby league. On 11 November 1995, France set a record when they defeated the All Blacks 22–15 at Toulouse—their third consecutive victory over the New Zealanders. A week later, on 18 November, at the Parc des Princes in Paris, the All Blacks took their revenge, inflicting a resounding 37–12 defeat. It was not until 1999 that the two teams met again, in a one-off Test at Athletic Park in Wellington. The All Blacks won 54–7; at the time France's largest ever loss. Tana Umaga scored three tries and Andrew Mehrtens kicked 19 points in the match. After their Athletic Park victory, the All Blacks were heavy favourites to win when they met France in the semi-finals of the 1999 Rugby World Cup. The game was played at the neutral venue of Twickenham Stadium on 31 October 1999. The All Blacks led 24–10 seven minutes into the second half after two tries (both from Jonah Lomu). France then scored two penalties and two drop goals to first five-eighth Christophe Lamaison to reduce the All Blacks' lead to 24–22 with 25 minutes remaining. Scrum-half Fabien Galthié chip kicked the ball to Christophe Dominici who then scored. Another Lamaison kick set up a try for Centre (rugby union) Richard Dourthe, which Lamaison converted, to take France into the lead, 36–24. France scored another try in the remaining five minutes, and although the All Blacks scored a last-minute try France won 43–31. Lamaison had scored 28 points, and a full house – a try, conversion, penalty and drop goal all in one match. Many have called this match "the greatest game in World Cup history". The Dave Gallaher Trophy was introduced in 2000 to be contested between the two teams. It was named in memory of All Blacks captain Dave Gallaher who captained the All Blacks against France in 1906 and who died at the Battle of Passchendaele. The Cup was first contested on Armistice Day (11 November) 2000. The All Blacks won 39–26 and scored two tries while Andrew Mehrtens scored nine penalties. The two met again the following week and this time France won 42–33, but as only the first Test counted towards the trophy the All Blacks retained it. The countries met in one-off Tests in 2001, 2002 and 2003. The 2001 Test was won 37–12 by the All Blacks, the 2002 Test was a 20 all draw and in 2003 the All Blacks won 31–23 at Jade Stadium. They met again in 2003 at the Rugby World Cup in Sydney. The match was a third-fourth play-off game and was won 40–13 by the All Blacks. In 2004 they met in a one-off Test in Paris. The 2004 Test was the first between the two teams with Graham Henry as All Blacks coach. France were 2004 Six Nations Champions, but were defeated by five tries to nil. The final score was a 45–6 win to the All Blacks; a record at the time. They met in France in 2006 – this time for a two-Test series. The first Test was played in Lyon on Armistice Day. The All Blacks defeated France 46–3 which was a record defeat for them at home. This was despite the All Blacks' team not being their strongest available. Following the defeat France's manager Jo Maso said that the All Blacks played the match, "for all the New Zealanders who died during the two World Wars in Europe". The following week the two teams met in Paris, this time to commemorate the centennial of the first ever All Blacks versus France Test. Despite fielding what coach Graham Henry described as his best team, the All Blacks achieved a less notable 23–11 victory. The next year France visited New Zealand for a two-Test series. The final rounds of the 2006–07 Top 14 season conflicted with the tour, so France sent a Test team short of 30 of their top players. With their weakened squad, the team was labelled "France C" by the New Zealand media. Featuring six new caps, France were defeated 42–11 in the first Test at Eden Park. The second Test was played the following week in Wellington, and the All Blacks achieved their largest ever victory over France with a 61–10 win. The defeat was France's heaviest in their history. France hosted the 2007 World Cup, and the two teams met in the tournament quarter-finals. Despite France's hosting of the tournament, the match was held at the Millennium Stadium in Cardiff, Wales. The match was won by France 20–18, and involved several controversial decisions by referee Wayne Barnes, who subsequently received death threats from some fans. France scored one try after the sin binning of All Blacks second five-eighth Luke McAlister, and another from a forward pass unseen by the referee. The All Blacks were strongly criticised for not attempting a drop goal in the game's final minutes. Their performance was analysed by Palmerston North based company Verusco who had analysed 1,500 games since 2000. They discovered that the All Blacks made 57 tackles to France's 269, and they had 66 percent possession and 60 percent territory. The playing time, that is time the ball is in play, was the longest of any game Verusco had ever recorded. An 'Independent Review of the 2007 Rugby World Cup Campaign', conducted by Russel McVeagh lawyers and SPARC (Sport and Recreation New Zealand), found that Barnes and the touch judges had a significant impact on the result of the match. The report states that "The penalty count was 10-2 against the All Blacks, with none awarded in the second half, despite dominance in territory and possession (which statistically should result in penalties awarded to the dominant side). On anyone's account the referees and touch judges made mistakes which worked against the All Blacks." Outside New Zealand and France, the focus was on the fact that, as in 1999, France had pulled off what The Guardian described as another "incredible triumph against the odds." In 2011, New Zealand hosted the Rugby World Cup. Unusually, France and New Zealand played twice at the tournament - both times at Eden Park. Both teams were in Pool A, and on September 24 New Zealand won their first encounter 37-17. New Zealand were pool winners, with France second. On either side of the draw for the knockout stage, both teams made the Final on October 23. New Zealand won 8-7 and for the second time won a home World Cup with France runners up. As of the end of the 2015 Rugby World Cup, New Zealand and France have played 56 Tests. The All Blacks have won 43, France 12, and one has been drawn. Only four matches have been played at neutral venues; the 1999 World Cup semi-final at Twickenham, London, the 2003 World Cup third/fourth play-off match at Stadium Australia in Sydney, and the 2007 and 2015 World Cup quarter-finals at Millennium Stadium in Cardiff. New Zealand have scored considerably more points than France both in France and New Zealand, and at neutral venues - although at neutral venues France have won two of the four matches. A summary of the Test match statistics can be found below. New Zealand and France have played seven Rugby World Cup games, more than any other pair of teams, including six play-off matches. Five have been won by New Zealand and two by France. France's wins knocked New Zealand out of the 1999 and 2007 tournaments at the semi-final and quarter-final stage respectively. New Zealand's first two successful campaigns (1987 and 2011) ended with wins over France, both at Eden Park. New Zealand's other victories have come in a quarter-final (2015), a pool match (2011, again at Eden Park) and the 2003 third-place playoff. ^i : A full tour, rather than a tour, is when the All Blacks tour just France, instead of visiting France as an extension of a tour to the Home Nations. The 1977 All Blacks tour to France consisted of nine matches, including two Tests. ^ii : The 1924–25 Invincibles won all 32 matches, including four Tests, that they played throughout the British Isles and France. ^iii : France was admitted into the Five Nations in 1910, and achieved a win over Scotland in 1911 and Ireland in 1920, and in 1922 drew a match with England. ^ a b c d "'"The 1905/06 'Originals. rugbymuseum.co.nz. Retrieved 2007-07-12. ^ a b "8th All Black Test: 88th All Black Game". allblacks.com. Retrieved 2007-07-12. ^ Potter (1961), p. 175. ^ a b c Potter (1961), p. 102. ^ "New Zealand Maori Rugby Tour"
^ Whatman (2005), p. 139. ^ Potter (1961), p. 103. ^ a b Palenski (2003), p. 51. ^ "105th All Black Test"
^ "106th All Black Test"
^ a b c Palenski (2003), p. 52. ^ Dine (2001), p. 131. ^ Dine (2001), p. 154. ^ a b "158th All Black Test"
^ a b Palenski (2003), p. 53. ^ Palenski (2003), p. 55. ^ "220th All Black Test"
^ Palenski (2003), p. 61. ^ "231st All Black Test"
^ Dine (2001), p. 136. ^ "Ton-up Sella joy as France shock All Blacks". Agence France-Presse. 1994-06-26. ^ Trevelyan, Mark (1994-06-26). "Sella ranks All Black victory among his greatest". Reuters. ^ a b "326th All Black Test"
^ "344th All Black Test"
^ "392nd All Black Test"
^ a b "All Blacks down France 23-11 in Paris". Melbourne: theage.com.au. 2006-11-19. Retrieved 2008-01-24. ^ a b "Laporte ..."
^ Pryor, Matthew (2006-11-18). "New Zealand's best men seize opportunity against France". The Times. p. 103. ^ "France accuse All Blacks of disrespect". iol.co.za. 2007-06-06. Retrieved 2008-01-25. ^ a b "NZ inflict ..."
^ "Refs Selection Panel Stands Behind Barnes Despite Errors". New Zealand Press Association. 2007-10-17. ^ "Inquest begins into shock All Blacks exit". nzherald.co.nz. 2007-10-07. Retrieved 2008-01-25. ^ "Rugby: World Cup review released"
^ Fotheringham, William (October 8, 2007). "France Postpone Party to Avoid Another Hangover". The Guardian (London). Retrieved 2008-07-27. ^ "Team records: World Cup matches sorted by total played against each opposition". ESPNScrum. ESPNScrum. Retrieved 12 October 2015. ^ "All Blacks Player Profiles..."
^ "France vs Scotland > Games Won"
^ "France vs Ireland > Games Won"
^ "France vs England > Games Drawn"
"31st All Black Test: 201st All Black Game". allblacks.com. Retrieved 2007-07-22. "105th All Black Test: 483rd All Black Game". stats.allblacks.com. Retrieved 2007-07-22. "106th All Black Test: 484th All Black Game". stats.allblacks.com. Retrieved 2007-07-22. "158th All Black Test: 656th All Black Game". allblacks.com. Retrieved 2007-07-30. "220th All Black Test: 854th All Black Game". allblacks.com. Retrieved 2007-08-02. "231st All Black Test: 871st All Black Game". allblacks.com. Retrieved 2008-01-25. "326th All Black Test: 1044th All Black Game". allblacks.com. Retrieved 2007-08-06. "344th All Black Test: 1062nd All Black Game". allblacks.com. Retrieved 2007-08-06. "392nd All Black Test: 1112th All Black Game". allblacks.com. Retrieved 2007-08-12. "335th All Black Test: 1053rd All Black Game". allblacks.com. Retrieved 2007-07-12. "1906-1920: Des premiers pas avec de lourdes valises" (in French). lnr.fr. 2003-07-22. Archived from the original on May 9, 2008. Retrieved 2008-07-20. "1921-1930: Les Bleus commencent à accrocher les Britanniques" (in French). lnr.fr. 2003-07-23. Archived from the original on October 20, 2007. Retrieved 2008-07-20. "All Blacks Player Profiles, Match Details and Statistics—in France". allblacks.com. Retrieved 2007-10-25. Barclay, Chris (2007-06-02). "All Blacks crush France". nzherald.co.nz. Retrieved 2008-01-25. BBC News (1999-10-31) "France stun All Blacks". bbc.co.uk. 1999-10-31. Retrieved 2007-08-06. BBC News (2003-06-03) "Uncovering the Maori mystery". bbc.co.uk. 2003-06-03. Retrieved 2008-04-17. BBC News (2003-09-24) "1999: France 43-31 N Zealand". bbc.co.uk. 2003-09-24. Retrieved 2008-07-27. BBC News (2007-10-08) "Death threats outrage refs chief". bbc.co.uk. 2007-10-08. Retrieved 2008-01-25. "in the British Isles, France and North America". allblacks.com. Retrieved 2008-07-17. CNN/SI (1999-10-31) " 'Les Bleus' blacken New Zealand's campaign". sportsillustrated.cnn.com. 1999-10-31. Retrieved 2007-08-06. Dine, Philip (2001). French Rugby Football - Cultural History. Berg. "France vs England > Games Drawn". rugbydata.com. Retrieved 2008-01-26. "France vs Ireland > Games Won". rugbydata.com. Retrieved 2008-01-26. "France vs Scotland > Games Won". rugbydata.com. Retrieved 2008-01-26. "French buried in a blanket". The Times. 1989-07-03. "New Zealand v France Head to Head". allblacks.com. Retrieved 2007-07-12. "NZ inflict record defeat". news.com.au. 2007-06-09. Retrieved 2008-01-25. "NZL -vs- FRA". lassen.co.nz. Retrieved 2007-07-10. Gallagher, Brendan (2003-01-03). "Edwards settles the score". London: telegraphy.co.uk. Retrieved 2007-08-06. "Gallaher Cup is on a six month train ride around France". masseyrugby.com. 2006-05-17. Retrieved 2007-08-06. Gower, Patrick (2007-10-12). "Patrick Gower: Wayne Barnes' referee report card". nzherald.co.nz. Retrieved 2008-01-25. Kayes, Jim (2006-11-10). "Buck Versus The Brutes". Dominion Post. p. 6. Lampp, Peter (2007-11-10). "All Numbers In All Blacks Favour - Except Score". Manawatu Standard. p. 36. "Laporte: We need to revolt". tvnz.co.nz. 2006-11-16. Archived from the original on June 22, 2008. Retrieved 2008-01-24. Le Guernigou, Yann (1990-11-03). "Fox Leads Powerful New Zealand To Win Over France". Reuters. Mehaffey, John (1990-11-10). "Fox Engineers second New Zealand Rugby Union Win Over". Reuters. "New Zealand Maori Rugby Tour 1926–27". rugbymuseum.co.nz. Retrieved 2008-04-28. "Postwar revolutionaries". New Zealand Listener, Vol. 198, No 3386. 2005-04-02. Retrieved 2008-04-28. Potter, Alex; Duthen, Georges (1961). The Rise of French Rugby. Wellington: A H & A W Reed. Quinn, Keith (2005-12-23). "Madness and sadness in rugby world". tvnz.co.nz. Retrieved 2007-08-04. Rattue, Chris (2007-10-08). "Chris Rattue: Salute the victor - Glorious France". nzherald.co.nz. Retrieved 2008-01-25. Richards, Huw (2007-06-01). "Eden Park sees start of turf war". ft.com. Retrieved 2007-08-06. "Rugby: World Cup review released". nzherald.co.nz. 2008-04-17. Retrieved 2008-04-16. Short, Paul (2004-11-28). "Rugby Union: France dismantled by vintage All Blacks". Independent on Sunday. Archived from the original on June 22, 2008. Retrieved 2007-08-12. Smith, Tony (2006-11-18). "A Hundred Great Years". Dominion Post. p. 3. Soneji, Pranav (2002-10-24). "Buck's All Blacks fizz". bbc.co.uk. Retrieved 2007-08-02. Westerby, John (2006-11-13). "Second-string All Blacks continue to humiliate". The Times. p. 76. Whatman, Mike (2005). Khaki All Blacks A tribute to the Kiwis - the 2nd NZEF Army Rugby Team. Hodder Moa Beckett Publishers Limited. "World Cup: France shock All Blacks in quarterfinals; England next". iht.com. 2007-10-06. Retrieved 2008-01-25.